Foam Board: The most widely used board because it’s inexpensive and easily disposable. This is the correct board to choose for a piece that is going to be used once or just a few times because it’s a bit flexible and the corners tend to ding easily. Available in white or black. Mighty-Cor: A popular option for those items that need to last longer. Mighty-Cor is stronger than foam board and easier to cut than gator board. Available in white. Gator Board: A sturdy option for those pieces that will be used over and over again or will endure rough handling. Gator board comes in white and black. Sintra Board: Sintra Board is thinner than any of the other options but is very heavy so isn’t a good choice for large images. It’s a good choice for items that need to endure. It is available in white and black. Of course, all dry mounted pieces can be over-laminated with a matte or gloss finish to protect them from fading, water damage or just to preserve them. Protect your paper – small or large! There are two ways to laminate your pieces. 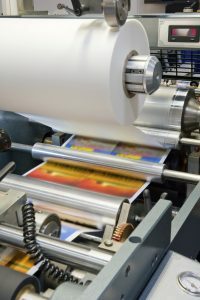 The first is overlaminating which is a single sided process that is done when lamination is being put down over an image on a pre-mounted board (e.g. Foam Board). This is available in matte and gloss finishes and can even be used as to create a dry-erase display or exhibit that might get written on and reused. The second is double sided or encapsulated lamination. This process is used for a variety of applications. A salesperson may want to take an oversize exhibit with them on a plane so they don’t want it dry mounted onto a foam board (difficult to carry). Instead, they prefer to be able to roll it up and carry it on board. Or, a law firm wants to make small, wallet-sized telephone lists for their partners to carry in their wallets. One medical client laminates instruction sheets because they will be used as guidelines in veterinary offices for surgery. Encapsulated lamination comes in three millimeter widths; 3 mil, 5 mil and 10 mil. 3 mil is the thinnest and is used when a piece needs protecting but also needs to be flexible. It rolls up easily. 5 mil is the standard for most items as it is not too flexible and not too stiff. It doesn’t roll into a tight roll (rather a loose one) but it doesn’t bend easily either. 10 mil is very hard and used mostly for protective covers of booklets or other such applications. The pointed edges are sharp and some of our staff have experienced minor cuts when handling! Encapsulated lamination is also available in matte and gloss finishes. Let the experts at BBP help you decide the best type of lamination for your application.